In Greek mythology, the Roman god Saturn was called Cronos. Cronos was one of the six Titans born to Uranus, (Father Sky) and Gaia (Mother Earth). Uranus and Gaia had other children too, but Uranus threw them deep into the earth because of their ugliness. In a battle to free his brothers from the earth, Cronos overthrew his father and became lord of the universe. He then castrated Uranus and threw the parts into the sea. Saturn's rule ushered in a Golden Age of peace and security. He did not, however, free his brothers from the depths of the earth. Fearing that one of his own children would try to overpower him, Cronos swallowed each one as they were born. 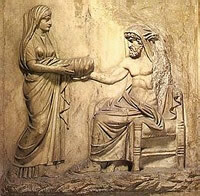 But when Zeus was born, Rhea, the wife of Cronos, handed Cronos a stone wrapped in swaddling clothes and hid the newborn Zeus away on a secret island so that Cronos could not find him. 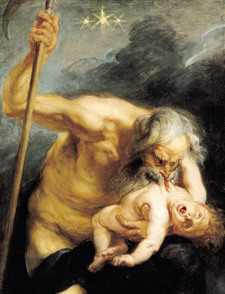 Eventually Cronos was indeed dethroned by his son, Zeus, and the swallowed children were freed. 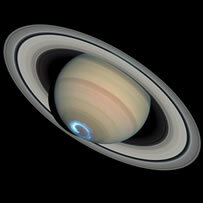 Saturn is a masculine planet, associated with the king, the mogul, the monarch, the chieftain, the leader, the father. He is the wisest and strongest man in the tribe who must take care of and provide for his people. He must keep them safe from harm. All of this involves the bearing of great responsibility and the fulfilling of duty and obligations. A modern day example of Saturn in action is the response of Captian Chesley "Sully" Sullenberger in handling of what could have been a far worse disaster, the landing of US Airways flight 1549 in the Hudson river. 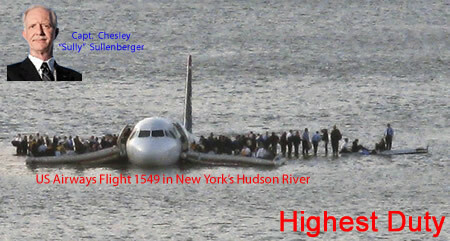 Captain Sully's courageous and skillful actions saved the lives of 150 frightened and helpless passengers. Facing your fears and protecting yourself from danger are an important part of the Saturn energy. The lessons of Saturn involve accepting the responsibilities required of us, being willing to carry the load, and working hard to achieve far off goals. There are no frills involved with Saturn. It requires that you be practical and waste not. Where jupiter wants to expand, Saturn wants to conserve, to pull in, to constrict. Where you find Saturn in your chart is where safety and security is most important to you and where you have lessons to learn about responsibility and exercising authority. The sign Saturn is in shows the manner in which you handle your duties and how you display your leadership. Because it requires learning to intract with those outside of ourselves, Saturn is classified as one of the Social Planets. A negatively placed Saturn can show painful and guilt-ridden experiences from past lives related to carrying out your duties. It can also indicate how you have avoided responsibility or abused your position in the past and may experience a heavy load there in this life. The times when transiting Saturn hits your natal planets are times when events will occur in your life that teach you these nasty and sometimes painful lessons. Sometimes they bring healing of painful memories. These are not easy lessons. As Thomas Paine said way back in 1776, "these are the times that try men's souls". And women's too. When Saturn is Retrograde, it is a time of re-doing, refining what you have done before. In your natal chart, it shows that you have not yet accepted all of these lessons so you get to do them over again. Saturn has a lot to teach us about self-discipline. Whether we want to learn it or not, Saturn will insure that eventually we will have to listen. Saturn is often referred to as "father time", an indication of the inevitability of aging and eventual death. Its transits demand that we learn patience and an understanding of the value of life. When Saturn is positively placed, it shows that you have heeded these lessons in previous lives and have already paid your dues. You can now reap the rewards and even become a great leader in this lifetime. Saturn is the second largest and the last of the planets visible to the naked eye. It's almost twice as far away from the Sun as Jupiter, but it's day is about the same at a little more than 10 hours. It takes over twice as long to orbit of the Sun, at approximately 29 years. And of course, it has those beautiful rings that we now know are really dust bunnies. Saturn Turns retrograde about every twelve months. It usually turns retrograde twice in each sign. The retrograde periods last about four months.